This site is a pilot project for an online research tool for the study of women’s dress in America from 1770 to 1930. Our initial work has focused on research materials from the personal research archive of costume historian Nancy Rexford. In over 30 years of consulting work, Ms. Rexford has collected materials that serve as an impressive finding aid both to women's fashion periodicals from the late 18th to early 20th century and to original objects that are in small collections all across the country. Ms. Rexford's notebooks are organized by item type, with xeroxes of fashion illustrations, text, and advertisements from a multitude of different fashion periodicals. Each item is placed in chronological order, so by looking through the notebooks page by page, one can more easily see subtle variations in fashion over time. 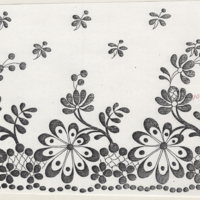 Our work so far has digitized portions of Ms. Rexford’s archives on border design, shawls, wrappers, mourning dress, and day dresses from 1800-1829.